Interestingly, in the pilot episode of Open All Hours (above), Nurse Gladys was played by the Irish actress Sheila Brennan, and you'll also notice how the both the characters and the comedy haven't quite developed into what we became used to during the main series. 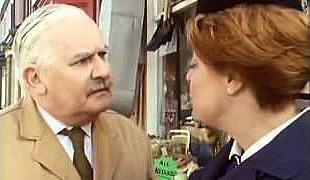 Open All Hours was a comedy that oozed Britishness from every orifice. The classic sitcom was set in one of those wonderful, old-fashioned corner shops that sold a little bit of everything. It featured an obsolete, finger-trapping till that should have had a "highly dangerous" displayed on it. The shop's owner, Albert E. Arkwright, is also old-fashioned. He is an unreasonably thrifty man with a stammer, and he would sell you the soles of his shoes if he could get away with it! His main priorities are making sure his errand boy, Granville (David Jason) was pulling his weight and also chasing the volupterous nurse Gladys Emmanuel (Lynda Baron) who is forever resisting Arkwright's advances. Granville lost his mother (Arkwright's sister) at an early age and has little choice in being under the care of her brother, who often refers to his Hungarian father. Granville is a dreamer who feels he is missing out on the finer things in life due to being chained to the shop with a heavy workload. For a man in his late 30s, David Jason pulls of the role of a young errand boy brilliantly. However, that fair isle tank top he wore was very annoying! 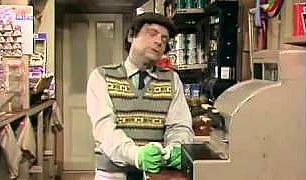 Four series (26 episodes) were aired between 1973 and 1985, and the first two series were originally broadcast on BBC2 in 1973 and 1976, before moving to a prime slot on BBC1. 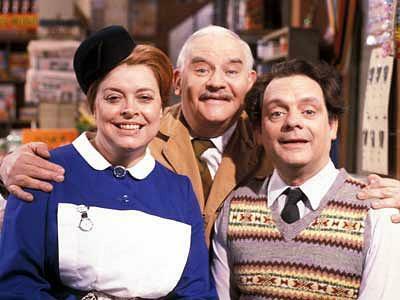 Left to right: Nurse Gladys Emmanuel (Lynda Baron), Albert E. Arkwright (Ronnie Barker) and Granville E. Arkwright (David Jason). The milk delivery girl (played by Barbara Flynn) appeared in 10 episodes between 1981 and 1985, and Granvile had a huge crush on her. Mrs Blewitt (Kathy Staff) made an appearance in 7 episodes between 1971-1981 and was very critical of just about everyone. The undecisive Mavis (Maggie Ollerenshaw) found it impossible to choose which products to buy in the shop, which made her the ideal customer for the penny-pinching Arkwright!